Louisiana Pork Riblets are a nice alternative to Wings but if having a larger crowd, serve both Buffalo Chicken Wings and Riblets, you will be the hit of any party. The same Blue Cheese Dipping Sauce goes great with both. 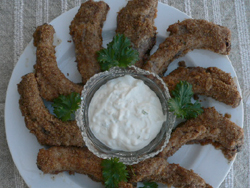 When I made these I was serving for dinner so I used baby back ribs as shown in the picture instead of appetizers. What a wonderful meal they made when served with coleslaw and pork-n-beans. 1. Heat oven to 350º F. In a small bowl mix butter and hot pepper sauce. In a shallow plate mix seasoning and breadcrumbs. 2. Dip ribs into butter mixture and then seasoning mixture. Arrange on an ungreased baking sheet. Bake 45 minutes, until golden and cooked through. Serve with Blue Cheese Dipping Sauce. Tip: Have the butcher cut the ribs for you, save yourself the extra work. Sometimes you can find them pre-cut in the meat case, so check there first.